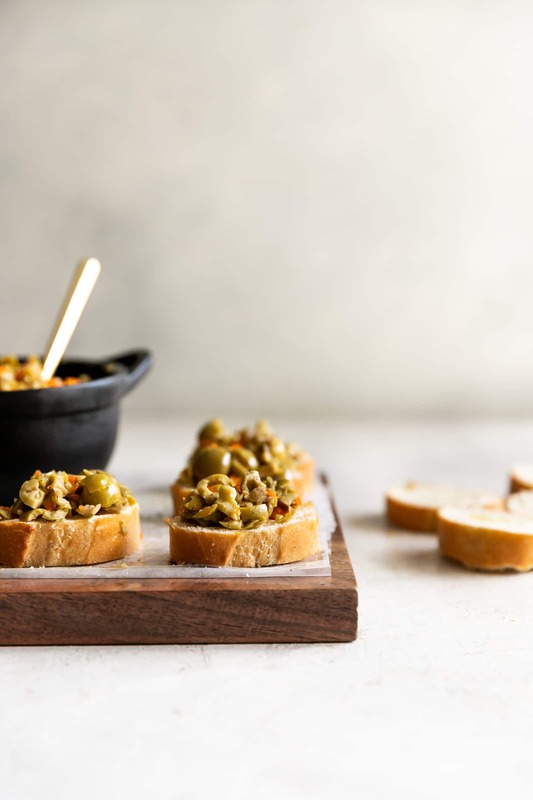 A simple yet irresistible appetizer made with tart, briny olives, capers, fresh garlic, pepper, and olive oil then served on toasted baguette slices brushed with olive oil. Have you ever made an appetizer that everyone just goes wild for?! Me too! I have a few go-to appetizers in my arsenal, but this one, my friends, this one is my ultimate fave. Why? Because I love olives. And if you love olives like I love olives, then you’re in for a treat! 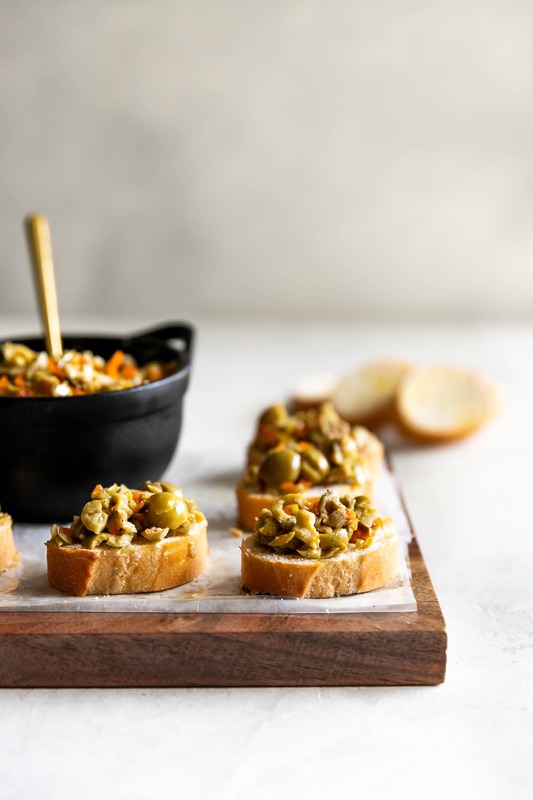 May I present you…olive bruschetta crostini! Today, I partnered up with Carapelli to bring you the easiest appetizer you’ll ever make. 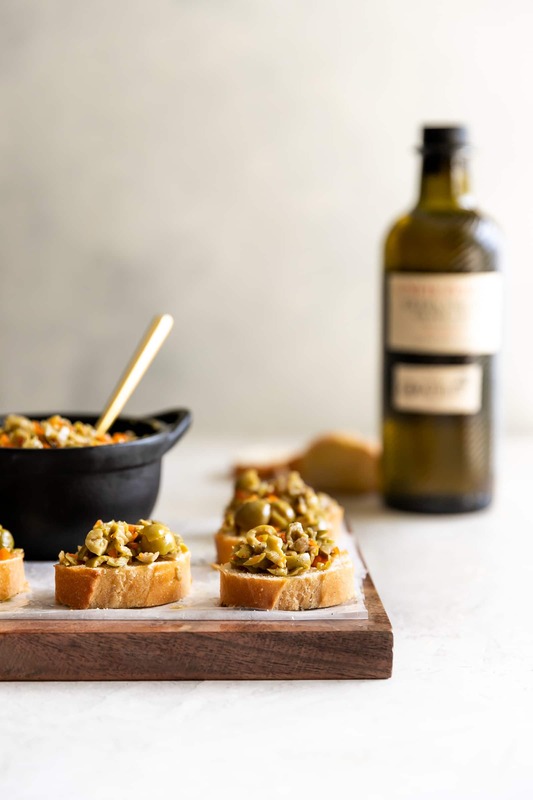 This olive bruschetta crostini comes together beautifully with Carapelli Unfiltered Organic Extra Virgin Olive Oil. With its dense and nutty flavor, it elevates any dish with its remarkably balanced and flavorful cold-extracted oil. Best part about this appetizer, there’s no cooking required! 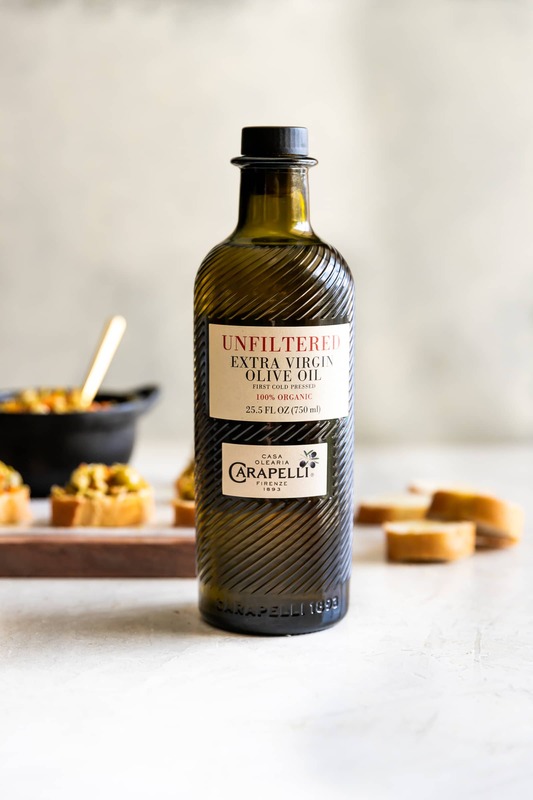 Just a few ingredients including Carapelli’s rich tasting extra virgin olive oil and you’ll be enjoying this with friends and family in no time. Can’t think of a better way to use this premium olive oil! 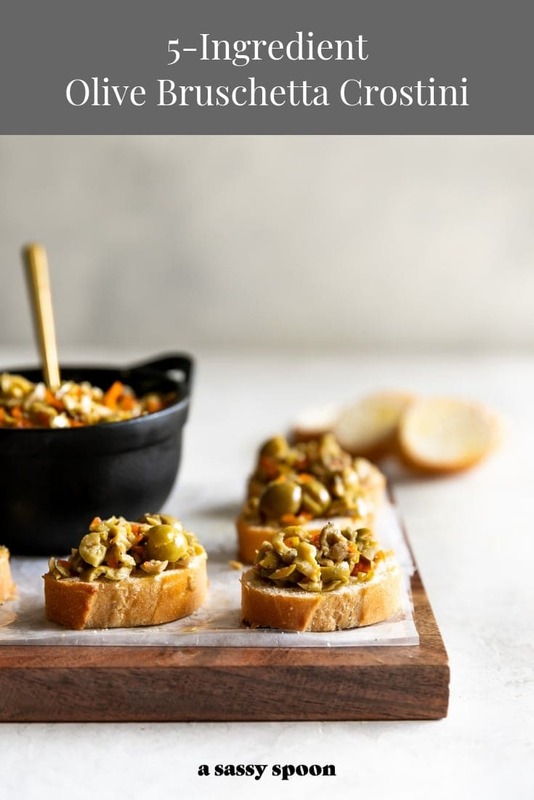 Tart, briny olives, fresh garlic, capers, rustic olive oil, fresh black pepper, crunchy slices of toasted baguette brushed with olive oil. I mean, what’s not to like. 5 ingredients, 10 minutes! That’s it! First things first, cut a baguette into slices and brush with Carapelli Unfiltered Organic Extra Virgin Olive Oil. Toast it in the oven for a few minutes. Meanwhile, add all the ingredients into a food processor. Give it a few pulses until it’s all roughly chopped. You don’t want the olives to end up too chopped because the mixture will be too wet and mushy. We want texture! A few pulses will give you just that. 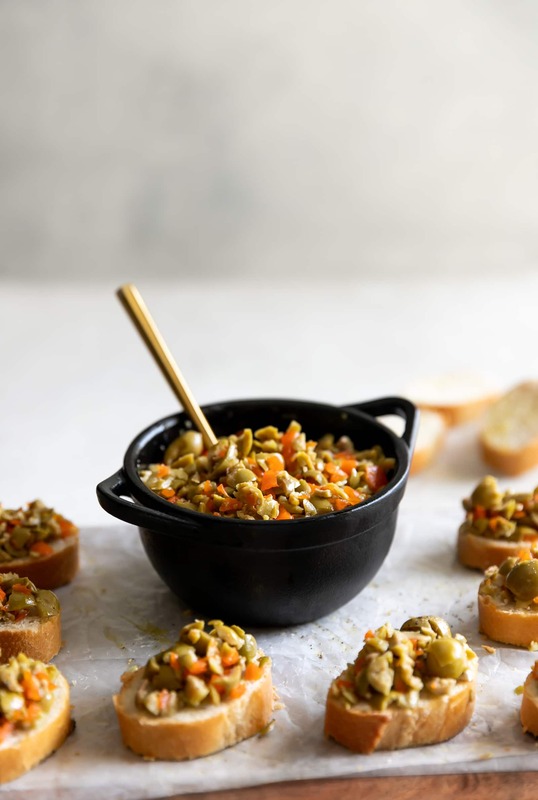 You can make olive bruschetta the day before serving and place it in an airtight container. Make sure it is room temperature when you’re ready to serve. You can either spread the bruschetta on baguette slices or have your guests spread the bruschetta on toasted baguette slices themselves. 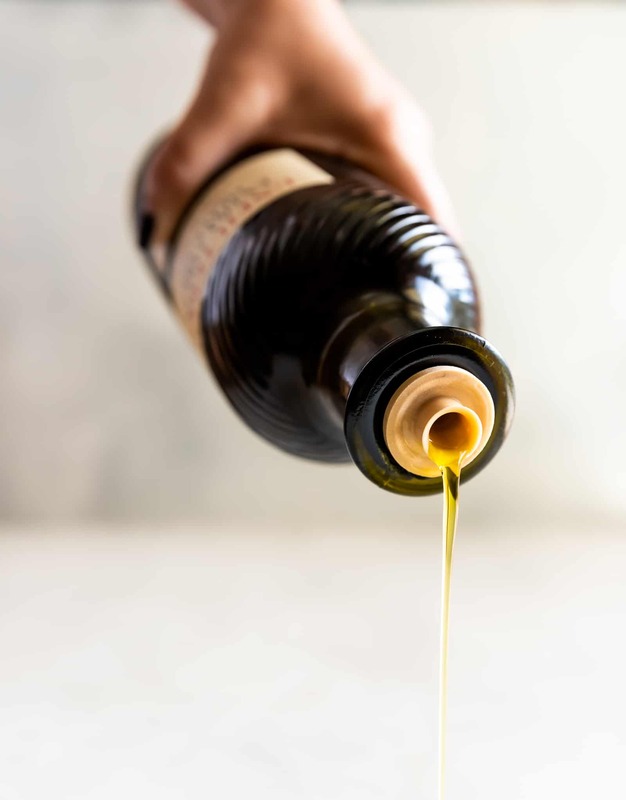 Either way, make sure to drizzle a bit of Carapelli Extra Virgin Olive Oil before devouring because it’s A MUST. I’ve been making this appetizer for years. It is a highly requested one in my circle and I hope it becomes a fave for you too. Cheese Board with 3 of my fave apps! In a food processor, add in olives, capers, garlic, olive oil and pepper. Pulse until roughly chopped (about 3-4 pulses only to avoid the mixture being too mushy). Taste and adjust as needed depending on your preferences - more garlic, more pepper, more capers. I would not recommend adding salt. Transfer the mixture to a serving dish. Serve on toasted baguette slices and drizzle olive oil on top, if desired. Enjoy! 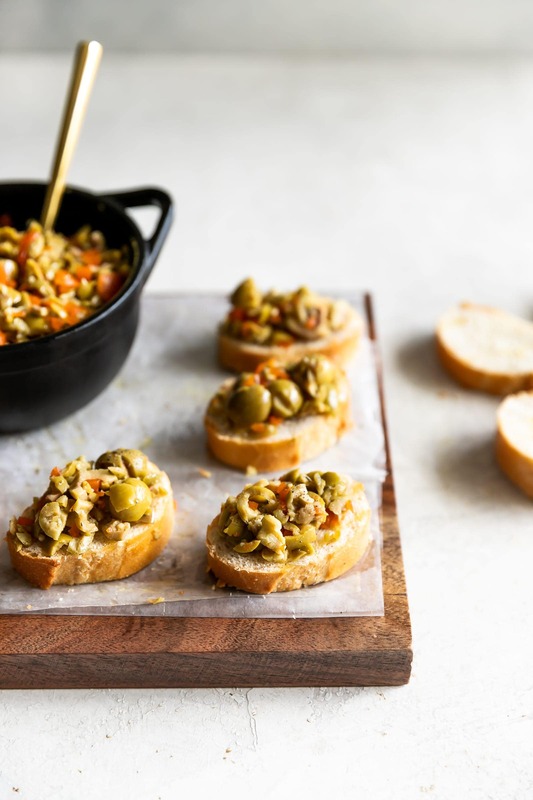 *Olive bruschetta can be made 1 day before serving. Serve at room temperature. **Other uses: spread olive bruschetta on sandwiches, pasta, roasted veggies, grilled chicken, and seafood. I love green olives but have never made anything with them! Usually just get my fix with a good bloody mary haha. This recipe not only looks delicious, it looks easy too! My husband actually doesn’t like olives or capers! He’s a picky eater… but I love those ingredients so more for me! lol. Thanks for sharing! I love green olives! This looks so SO good, Jamie! Thanks for sharing! This is like a deconstructed tapenade. Fun idea! 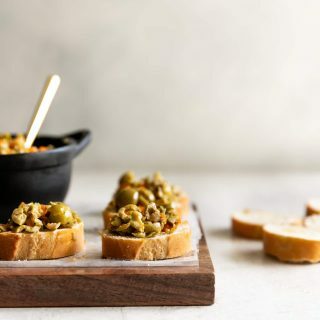 This is right up my alley, I absolutely love green olives and this looks so simple and easy to make! Yum! Ooooh! I LOVE olives! So easy to make too!! :D This is a fantastic and simple idea for even a quick dinner for myself! Thank you!